Premiere Events is a proud sponsor of the second annual International Special Events Society (ISES) Austin Day of Education! 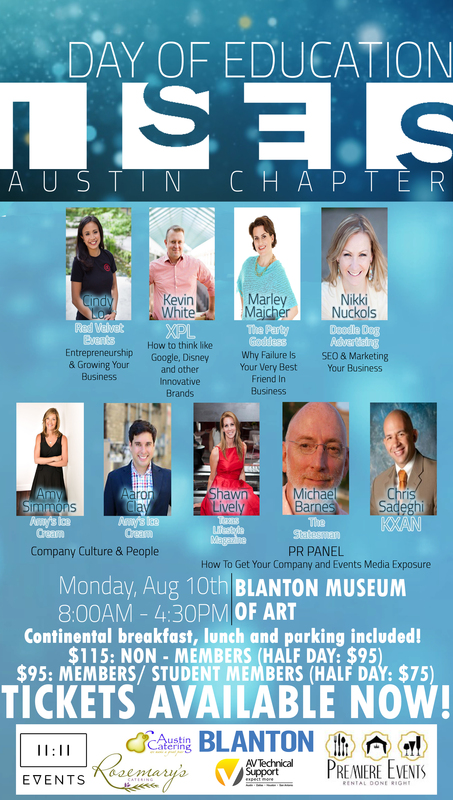 This year’s event is open to anyone (ISES members and non-members), and will take place on August 10th at the Blanton Museum. Amy Simmons, Founder & President of Amy’s Ice Creams: will be speaking on culture, mission statement, guiding principles and follow up with how you can impact culture with the Great Game of Business. Somewhere along the line, a good friend of mine, Simon T. Bailey, made the statement that “failure isn’t final” and I’m convinced he had me in mind when he said it. I’m actually kind of obsessed with failure. Why? Because it’s a subject I’ve had plenty of experience with during my 20+ years as an entrepreneur and it can crush the heartiest of souls. I wish I knew when I started how integral to the process failure truly is. In fact, if you’re not failing fairly regularly, you’re definitely not hitting the outer limits of your potential, guaranteed. Why do some companies seem to be constantly setting the trends, while others are following? What are Google, Disney, and 3M doing internally to foster a culture of innovation and ideation, and how can you adopt those principles to your team? Cindy Lo, Red Velvet Events: Industry Know-hows – It’s easy to fall in love with being a part of the events industry but how do you know when you need to hire your first employee; change business directions or heaven forbid close up shop? Hear first hand from Cindy 10 things she wished she had known before entering the events industry. A link to register can be found here. Your registration fee will include both breakfast and lunch as well as parking!! Half day options are also available. This entry was posted in Events and tagged 11:11 Events, Amy Simmons, Amy's Ice Creams, Austin Catering, Blanton Museum, Chris Sadeghi, Cindy Lo, Continuing Education, Day of Education, Doodle Dog Advertising, Event Industry, International Special Events Society, ISES Austin, Kevin White, KXAN, Micheal Barnes, Premiere Events, Red Velvet Events, Rosemary's Catering, Shawn Lively, Texas Lifestyle Magazine, The Party Goddess, The Statesman, XPL. Bookmark the permalink.